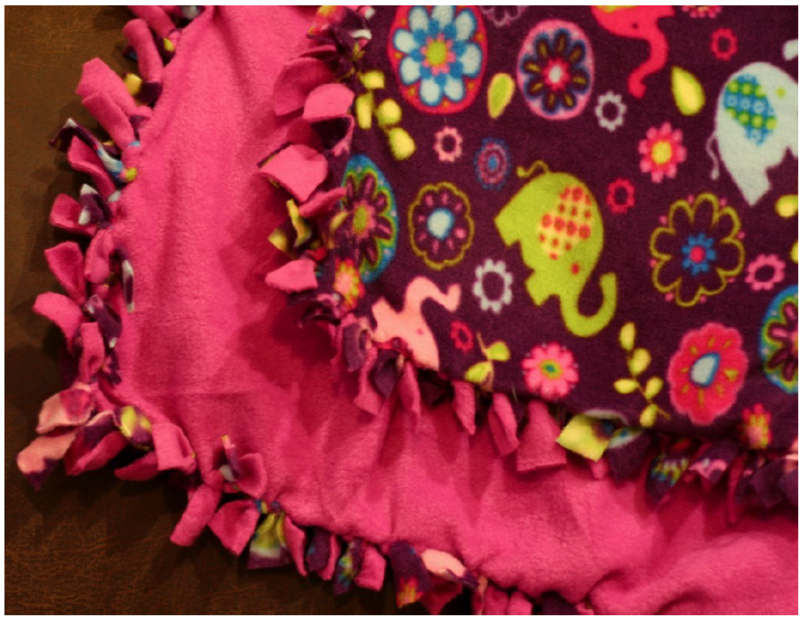 This video shows how to make a tied fleece blanket. Other videos on You-Tube show blankets put together by other means, such as cutting a slit in each fringe and pulling ends through the slit. In general, you need two 1.5-yard pieces of fleece with right sides out. Cut off selvages. Cut a 3.5 - 4 inch square out of the four corners of the two pieces. Cut 1 - 1.5 inch wide fringe around the edge of the fleece to the depth of the cut out squares. Painter's tape can help keep the fringe uniform. Then tie the two pieces together at each piece of fringe. - fold completed blankets into thirds- fringed edges to center-roll up and tie with a ribbon and the heart tag in the center of the roll. Label the size of finished blanket on back of the heart tag so the shelter knows if it is appropriate size for the child. See a YouTube video from the founder of this project to learn more about what goes into each purse. Sherri Wagemann's goal is for each chapter to bring a Purpose-Filled Purse to Spring Convention. Click on the Powerpoint item below to see the purses chapters have been putting together for this project.